Cucumbers are popular summer vegetables that grow well in any garden and are used for slicing, salads and pickling. You can click here to learn how to make your own pickles. Cucumbers are gourd fruits and are native to southern India. 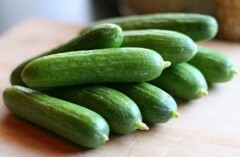 Cucumbers come in two types – slicing and pickle. Vines grow rapidly and need lots of garden space. To minimize the space required, cucumber vines can be trained along trellises and other vertical supports. Cucumbers have been an agricultural staple for 4,000 years. Early references to cucumbers are recorded in ancient Hebrew, Egyptian, Roman and Greek writings. Romans grew cucumbers in baskets which they moved around to take advantage of the most sunny spots. Christopher Columbus brought cucumbers to the New World were he planted them in his experimental garden in 1493. Cucumbers disappeared from Europe for a few centuries then gained popularity again in the 1600’s and have been around ever since.